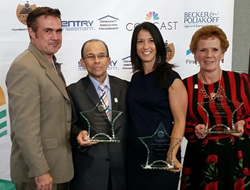 Campbell Property Management congratulates its clients and employees for winning awards and being finalists at The 2016 Florida Communities of Excellence Awards. Four of Campbell Property Management's clients were recognized at The 2016 Florida Communities of Excellence Awards.The awards, which are in their eighth year recognize communities and managers from across the state of Florida for outstanding achievements. The awards are independently judged by a panel of industry and government professionals who help recognize communities for their best practices and accomplishments in categories, including Water Conservation, Energy Efficiency, Florida-Friendly Landscaping, Civic Volunteerism & Advocacy, Communications & Community, Family Friendly Programs and Initiatives, Disaster Preparedness, Safety & Security, Financial Innovation, “The Comeback Kid," The Trendsetter Category and the Community Video Showcase Category. This year, four communities managed by Campbell were recognized in five finalist categories. Tuscany Bay HOA in Boynton Beach won the 2016 Award for Financial Innovation in the small community category. Tuscany Bay has been a Campbell client since 2007 and is managed by Sandy Diaz. Turtle Cay HOA in Riviera Beach won the 2016 Award for Financial Innovation in the large community category. Turtle Cay has been a client of Campbell Property Management for 9 years and is managed by Richard Kuperman. Pines of Delray West won the 2016 Award for Communications and Community. Pines of Delray West is managed by Teri Fifth and has been a Campbell client for 9 years. Cypress Head in Parkland won the 2016 Community Video Showcase Award. Cypress Head has been a Campbell client since 2014 and is managed by Lori Belfatto. Turtle Cay was also recognized as a finalist in the Safety and Security Category. Campbell is extremely proud of their clients’ and managers’ hard work and dedication. Campbell has had nine clients win since 2009.